The Kats and Saucies face off in the final game of the home team season before Playoffs! All QCRG home games are played at Buffalo Riverworks, a multi-purpose venue located at 359 Ganson St. 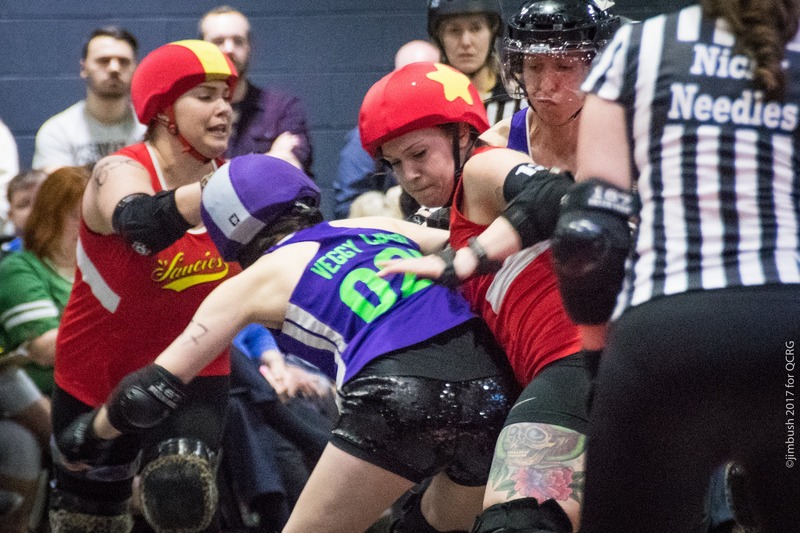 In addition to roller derby, Buffalo Riverworks houses 3 bars, a restaurant, a brewery, concert venue, covered outdoor ice rinks, and a second-level mezzanine overlooking the roller derby track. QCRG is very excited to be partnering with Buffalo Riverworks to offer a best in class experience to our fans across Western New York. Doors and will call open one hour before the posted event start time. All online ticket purchasers should check in at with Will Call at the Box Office when arriving at the game. Please direct order inquiries to orders@qcrg.net. Online sales close 5 hours before the posted event time. If you’ve missed the online sales window, tickets will be available at the Riverworks box office starting approximately one hour before the event starts. Front Row seats are $20 and offer the closest vantage to the action via the first row of seats outside of the 10 foot safely lane surrounding the track. All front row patrons must be 18 years of age or older. Upstairs balcony seats are likewise $20 and offer a unique vantage overlooking the track from the seats located on the second floor mezzanine. A front row or balcony pass guarantees a front row or balcony seat (respectively), although the specific seats themselves are first come, first serve. VIP Tables come in three options: in the downstairs restuarant there are 6 seat tables ($120) along the track edge and 4 seat tables ($80) immediately behind them. Upstairs 6 seat tables ($120) are situated along the balcony overlooking the track. VIP Tables options offer exclusive viewpoints and full restaurant service and are open to all ages. VIP Tables come with a minimum bar/restaurant spend ($100/6 seat table; $60/4 seat table) through Buffalo Riverworks (Menu: http://buffaloriverworks.com/theward/). Note – only VIP Tables have table service (drinks or food). All other seats can purchase food/beverages at the bars (upstairs and downstairs) or concession stands (downstairs). All ticket sales are final. We do not issue refunds or exchanges for any reason, with the following exceptions: if this event is cancelled entirely refunds will be issued to all customers; if this event is rescheduled refunds will be offered to all customers. If you lose a printed ticket before a game, don’t worry – we keep records of all ticket purchasers and you will be able to check in at will call.